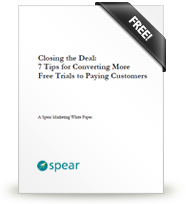 With the emergence of Software as a Service (SaaS) and Open Source platforms, free trials are once again a primary means of acquiring new software customers. Too often, however, the rate at which those trial (or free) users convert to paid accounts is a fraction of what it should be. ... and more. To receive your free white paper, just fill out the form completely and click on "request now."